Coupons don't just help you save money on groceries; they're a terrific way to stretch your dollars and make it possible to fill an extra shoebox or two! 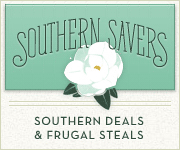 If you're new to couponing, there are many good websites that can explain how it works, but two we recommend are Southern Savers and Clip with Purpose; just click on the icons and links to the right to begin exploring the wonderful world of couponing! Watch for sales at the end of each season or holiday for great shoebox items at REALLY LOW prices. You'll be able to fill MORE shoeboxes for LESS money and bring MORE smiles to MORE faces!